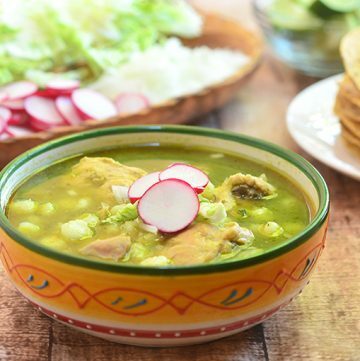 Mexican Chicken Posole Verde with tender chicken, hominy, and flavorful tomatillo sauce is a hearty soup bursting with Mexican flavors. Serve with crunchy tostadas and all the trimmings for a satisfying meal! 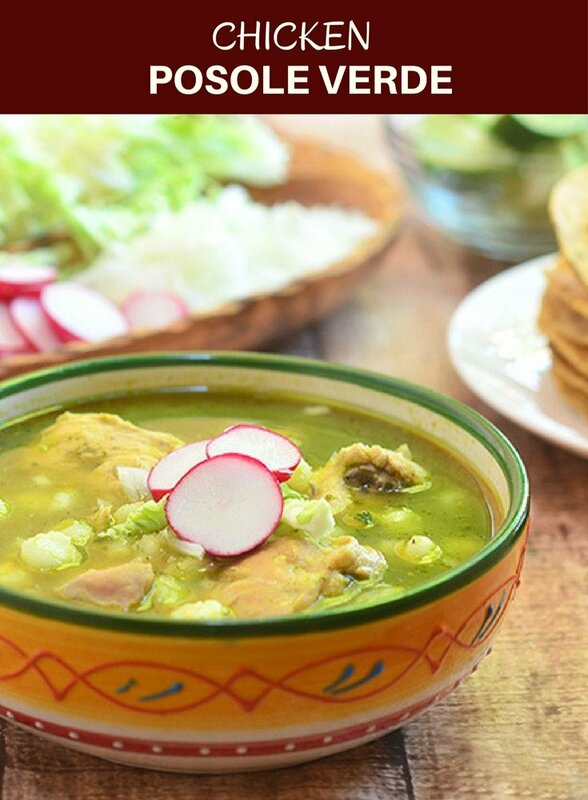 Pork pozole is one of my favorite Mexican food to make especially during the cold winter months. It’s such an easy dish to prepare it’s all a matter of simmering the meat until fall-off-the-bone tender and adding the blended peppers. Today, however, was the first time I tried my hand at chicken posole verde. I went to our neighborhood Mexican grocery store early this morning to buy pork and guajillo peppers for the pot of red-style pozole I was meaning to make for lunch. While waiting to be helped at the meat section, I was fortunate to strike a conversation with a fellow customer who suggested I try the chicken version instead. 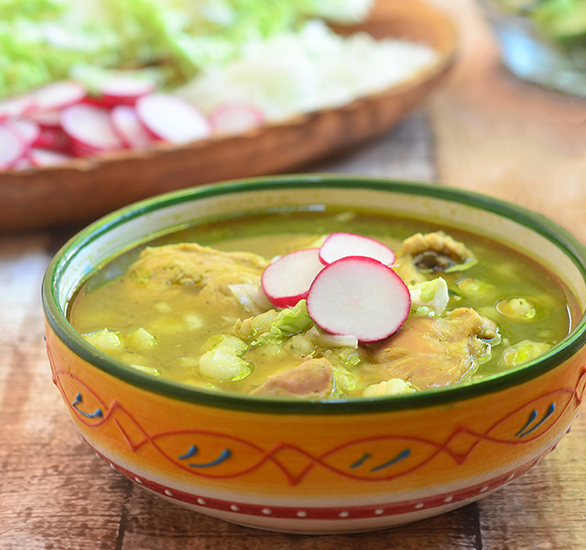 As much as love pork pozole, this pozole verde with chicken was a delightful change. Chock-full of chicken, hominy, and a fragrant broth, it made a comforting bowl of goodness perfect for chilly winter days. If you’re looking for authentic Mexican food, this hearty stew definitely delivers the big, bold flavors you’ll love. Serve it piping hot with crisp tostadas plus the raw vegetable garnishes and enjoy the ultimate cold weather comfort food! I like to roast the tomatillos and chili peppers to add smoky flavor but you can instead simmer them in broth or water to soften before blending if you prefer. 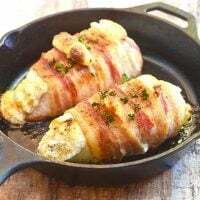 I use bone-in chicken for deeper flavor but you can also use boneless chicken breast or thigh meat. 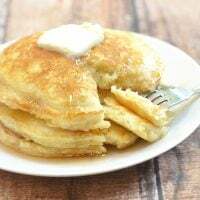 If you want the rich flavor from the bones and still have the soup easy and convenient to enjoy, debone and shred the chicken when cooked through and return to the pot. 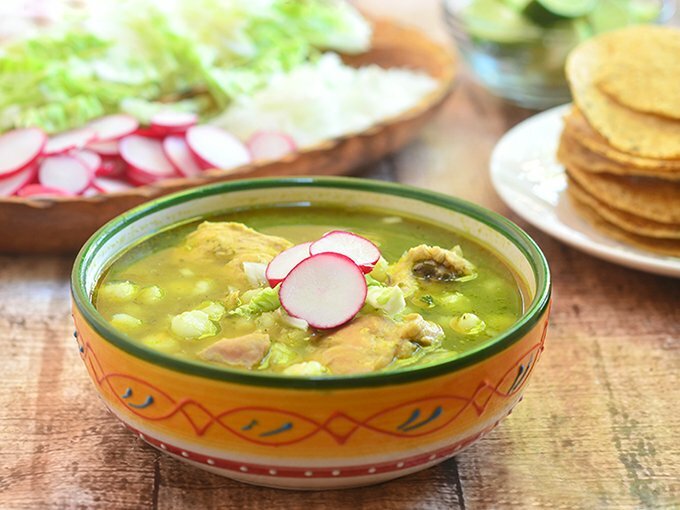 Pozole can be made with either pork, chicken or a combination of both. If you want to add pork, sear the cubed pork shoulder in hot oil until lightly browned on all sides and then simmer with the chicken until tender. In a large pot over medium heat, combine chicken and water. Bring to a boil, skimming scum that floats on top. When broth clears, add onions, garlic, and salt. Lower heat, cover and continue to cook for about 10 to 15 minutes. In a pan over medium heat, arrange tomatillos and in a single layer. Cook, turning as needed until slightly charred and softened. 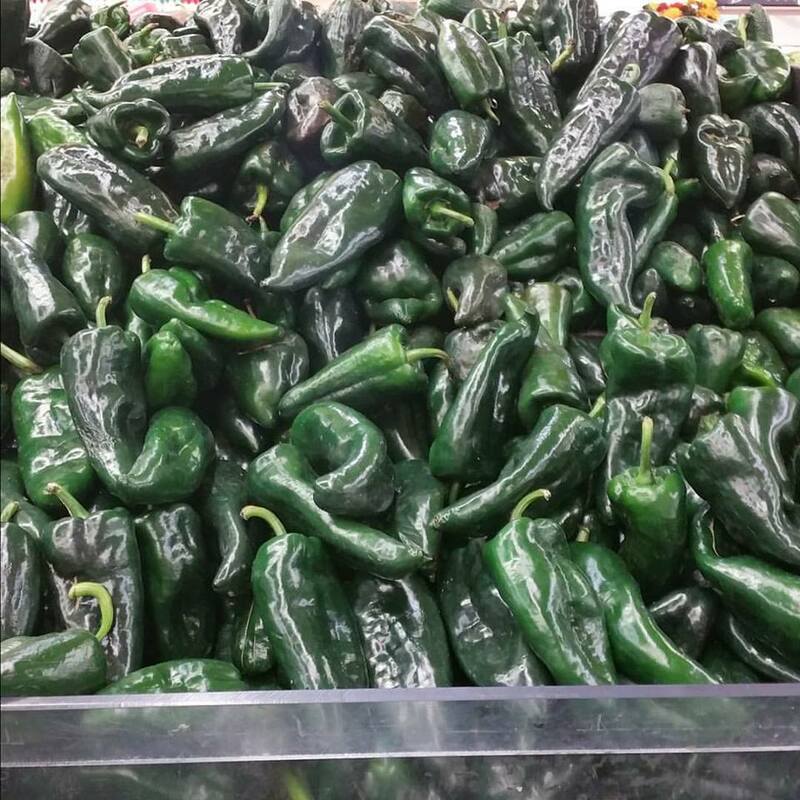 Over gas flames, arrange chili pasillas and jalapeno in a single layer and roast until skins are charred. Under cold running water, remove and discard charred skin. Core and deseed peppers. With a slotted spoon, remove onions and garlic from the pot. In a blender, combine tomatillos, jalapeno and pasilla peppers, onions, garlic, and about 1 cup of the hot broth. Process until very smooth. Add pureed chili mixture into the pot. Add hominy. Continue to simmer for about 20 to 25 minutes or until chicken and hominy are tender. Season with additional salt, if needed. Ladle into bowls and garnish with shredded cabbage, chopped onions, chopped cilantro and sliced radish. 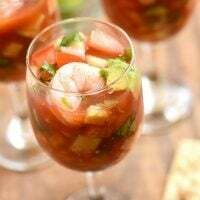 Serve hot with lime wedges and tostadas on the side. I love that it has hominy!! 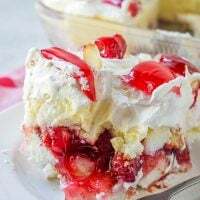 I love it, but haven’t had it for years!